The market is expensive, but there are still some great value stocks available. Value stocks come in all shapes and sizes, and value investors can have wildly different portfolios despite sharing the core idea that buying something for less than it's worth is the best way to beat the market. Growth plays an important role in value investing, as a company's intrinsic value depends not only on its current earnings power, but also on its growth potential. We asked three of our contributors to each discuss a stock that they consider to be a great value in today's market. Here's why Walt Disney (NYSE:DIS), International Business Machines (NYSE:IBM), and Amgen (NASDAQ:AMGN) are cheap value stocks worth buying. Evan Niu, CFA (Disney): While shares of Disney are trading near 52-week highs right now as they've been mounting a recovery in the past couple of months, the stock is still relatively cheap by historical standards. Disney is trading at just under 21 times earnings and a little less than 19 times free cash flow. Both valuation metrics, among others, look quite compelling compared to mid-2015. It's possible that the market got slightly ahead of itself back then, and the fundamentals have now caught up. DIS PE Ratio (TTM) data by YCharts. While most consumers associate Disney with its plethora of popular film franchises -- from Marvel to Star Wars to Pixar to its resurgent animation department led by Pixar's John Lasseter -- investors know that the studio entertainment business is a relatively small part of the business, generating just 17% of operating income last fiscal year. Of course, the intellectual property that originates there goes on to feed the other business segments, so it's not just about the raw numbers. The heavyweight in terms of profitability is Disney's media business, which has been under pressure from the ongoing trend of cord-cutting. This isn't news. But what's encouraging is that Disney is preparing to adapt to the changing times. Disney announced an over-the-top streaming service for ESPN last year without specifying timing, but just this week at an investing conference CFO Christine McCarthy said the service would launch sometime in 2017. McCarthy also added that Shanghai Disneyland boasted 4 million guests within the first four months. Disney's capital expenditures are concentrated on building parks and resorts; nearly 90% of fiscal 2016's capital spending was allocated to parks and resorts (which brought in 20% of operating income). 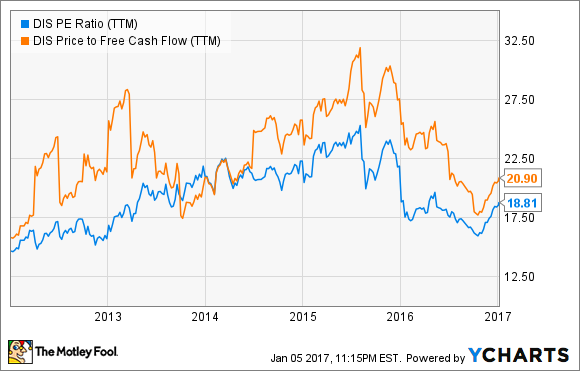 Considering the capital requirements, looking at Disney's free cash flow is important, particularly as it relates to the company's dividend. But as you can see in the chart above, investors are getting a pretty good deal in terms of free cash flow -- even at current prices. Tim Green (International Business Machines): There are plenty of stocks that look cheap, but I wouldn't necessarily call those value stocks. Buying a stock for less than it's worth today fails as a strategy if its value declines over time. A company with a competitive advantage, which gives it a good chance at becoming more valuable, trading for less than it's worth is what value investors should be looking for. With the market fairly expensive, I'm having trouble finding many true value stocks. International Business Machines would be my top pick (not coincidentally, IBM is also my top holding). The company has been transforming itself over the past few years, shifting resources to areas like cloud computing and analytics in an effort to adapt to a changing technological landscape. The jury is still out on whether this plan will work, but IBM's broad base of customers and long history of adaptation gives me confidence that it will eventually emerge a stronger company. IBM expects to produce at least $13.50 in adjusted earnings per share in 2016, putting the price-to-earnings ratio at about 12.5. IBM will need to return to earnings growth for the stock to fully recover from its multiyear slump, and it's unclear exactly when that will happen, but investors can enjoy a solid 3.3% dividend while they wait. George Budwell (Amgen): Amgen's shares have more or less traded sideways over the last year due to its ongoing battle with the patent cliff and the less-than-stellar performance of its new cholesterol drug Repatha. A deeper dive, though, shows that this biotech stock offers tremendous value for investors willing to take the long view. The short story is that Amgen offers a lower-than-average price-to-earnings ratio for a major drug manufacturer, a strong balance sheet, ample free cash flows, and a dividend yield of 3% that's near the top of its peer group. As an added layer of value, Amgen recently won a pivotal patent case against Sanofi and Regeneron banning the duo's rival cholesterol drug Praluent from the all-important U.S. market. As Pfizer unexpectedly abandoned the development of its own version of this new class of lipid therapies late last year, Amgen's Repatha is now the only game in town, which could translate into an extra $2 billion in peak sales down the road. So if Repatha's cardiovascular outcomes trial dubbed "Fourier" produces positive results this quarter, Amgen could very well have its next megablockbuster already in hand. And in a worst-case scenario in which Repatha fails to hit the mark, the biotech still sports multiple growth products like the multiple myeloma treatment Kyprolis to fall back on.